Clean quartz chips strands. 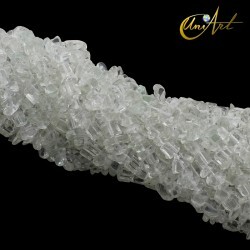 Each strand measures about 80 cm and contains about 260 chips of clean quartz. 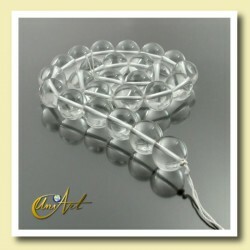 Crystal Beads (transparent quartz) in cube shape. Quality Super Extra, without inclusions. Measures: 6.0 x 6.0 x6.0 mm · String with about 40 cm in length. · Contains 53 cubes and weighs 31 gr. approximately. 10 mm Crystal round beads (transparent quartz). Quality Super Extra, without inclusions. Measures: · String with about 40 cm in length. · Contains 40 balls and weighs 56 gr. approximately. 14 mm Crystal round beads (transparent quartz). Quality Super Extra, without inclusions. Measures: · String with about 40 cm in length. · Contains 28 balls and weighs 106 gr. approximately. 16 mm crystal quartz matte polish round beads (transparent quartz in matte polish). Quality Super Extra, without inclusions. Measures: · String with about 40 cm in length. · Contains 25 balls and weighs 154 gr. approximately. 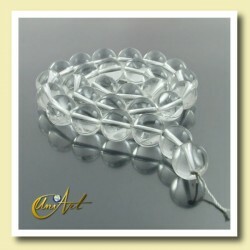 16 mm Crystal round beads (transparent quartz). Quality Super Extra, without inclusions. Measures: · String with about 40 cm in length. · Contains 25 balls and weighs 143 gr. approximately.